From cover to cover Lady in Waiting by SUSAN MEISSNER is magnificent. The novel is Christian fiction based on the life of Lady Jane Grey. At the end of the book Susan Meissner separates the truth from the fiction. The novel as a parallel between the lives of two women. One woman, Lady Jane Grey, lived during the 16th Century. In the modern era there is Jane Lindsay living her life. She is a mother, wife and daughter. When she finds a ring tucked away in the spine of a very old prayer book, her whole life changes. God does give HIS sheep the ability to think creatively while circumstances in our lives seem to be falling apart. Random House Authors This novella is full of Christmas magic. It is the perfect book for any person who is not feeling the excitement of Christmas. 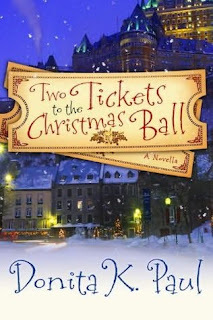 Donita K. Paul turns on all the Christmas lights and decks all the halls with romance in Two Tickets to the Christmas Ball. There is also a bookstore, an old fashioned bookstore on a street named Sage street. I loved the name of the street. The name of the bookstore is delightful too. I tried over and over to say the third name, "Wizbotterdad." I never could do it. I would love to hear Donita K. Paul pronounce Warner, Werner and Wizbotterdad .